31 pages : illustrations, maps ; 23 cm. Copyright, Florida Anthropologist Society, Inc. Permission granted to University of Florida to digitize and display this item for non-profit research and educational purposes. Any reuse of this item in excess of fair use or other copyright exemptions requires permission of the copyright holder. was provided by Mr. George A. Zabriskie and Mr. Sidney Lee Smith. aided in the publication of this paper. island, and some 800 feet along the main excavation axis (X-Y line). been finding various articles belonging to the Spanish colonial period. studying Spanish documents relating to the area. 1 This inlet, closed at the time of excavation, has since been reopened. some sections. In other sections dunes had been built up by the wave action. 3 See Kurz (1942) for a description of dune and scrub vegetation. and two by ten-foot trenches. Higgs and our own measurements may be explained by this factor. and horizontal continuance of artifactual material. 5 Higgs, 1942, pp. 32-33. Method of manufacture. Coil fractures present. sand and-or small to moderate amounts of crushed limestone. Texture. Coarse to medium, slightly contorted paste. Color. Surfaces are gray to tan, cores are gray to black. form includes small to large globular vessels and shallow bowls. from 4 to 8 mm. Plain sherds on the San Marcos paste were also found. 6 Smith, 1948. This ware was found in abundance at St. Augustine by \V. J. Winter and has been assigned to the St. Augustine Period (1565-1750). Its affiliations are with coastal Georgia types of a comparable period. 7 Goggin, 1940 and 1944. 8 J. D. Griffin, 1945; Goggin, 1939.
are not those typical in the area, but are wedge-shaped grooves. Plain and St. Johns Plain are types also found at Br 2.
rim is 4 mm. ; that of the body 6 mm. mentary holes at either end. The top, or bowl, hole is conical, 7 mm. found. One of the lines was 2 mm., the other was 1 mm. in width. The flat surface adjacent to the lines was burned red. smoothed edges and sides, which may have been part of a pestle. and the end smoothed down, was also found. of sherds were from the rim or base of vessels. Method of Manufacture. Wheel (?). Texture. Fine, crumbles when broken. pink paint, with the latter two being in the majority. 11 J. B. Griffin, personal communication. which may be monochrome parallel lines around rim and lip area. an orange, line around it, extending upward to where the body begins. Rim. Generally straight; one slightly flaring. height of base. Interior of base slightly convex. Thickness, Rim 3-4 mm. '; body 4-5 mm. Appendages. Loop handles, probably paired, occur below the lip. The one handle found is 7 mm. in diameter and 2.5 cm. long. color are the same as in Type A. Form: Same as in Type A.
Thickness: 3-5 mm. for both rim and body. side, and is indented on either side. Surface Finish. Orange painted interior and exterior. Decoration, One sherd has two concentric circles. waist there is a flaring skirt. Specimen is 5.5 cm. high (PI. 1, J). of the way around the cylinder (PI. 1, K). diameter at the base end. piece. The strip is flattened and displays tool marks on one side. 5. A baked clay fragment with finger-impressed concave area. 6. A small baked clay fragment.with an impressed fern-like design. found by Higgs, one of which is shown in Plate 3, A.
temper. No glaze or wash is evident. 15 Higgs, 1942, p. 39.
terized by underglaze in fish designs which look Japanese.Mrs. carried overland to Vera Cruz, reloaded on ships and sent to Spain. marks and gas bubble vents. Thickness of the sherd is 5 mm. with a thickness of 2 mm. figures of a darker blue. reversed). The rim is straight, and the lip is flattened. 17 Higgs, 1942, p. 39. 18 The results of this study will be published in a subsequent paper. blue areas surrounding conventionalized floral designs. each with a portion of a design. Thickness 2 mm. has a crackled surface. Annular ring base. Thickness 2 mm. 7. Sherd of an annular ring base plate. Both surfaces glazed white. in negative in the white surface color (PI. 1, F). and copied the style, form and technique of the Chinese porcelains. very closely approximate those used by the Chinese during this period. from 2 to 5.5 mm. L-M, Mexican ceramics, Type A (A-K, 62/100; L-M, 65/100). vessel (A-B, 4/10; C, approximately 1/3). mately actual size; B-E, 9/10). Temper. None to some fine sand and unidentified grit. surfaces are the same as exterior. Surface finish: Some smooth, some with throw marks. Form. Jar. No rim or lip fragments found. corrugated appearance caused by unsmoothed throw marks. Temper. None to fine sand. Color. Paste is dull gray, reddish or cream. glazed interiors and white glazed exteriors are known. and incurving above the shoulder. Rim, Thickened, incurved or everted. Appendages. Strap handles placed diagonally on the shoulder. pieces of grit as much as 6 mm. long. Quartz sand in some sherds. brown to a dark red, and are generally smudged. as interiors. Exteriors have a smooth, slick feel. and rims are straight or slightly inverted. Thickness. 5 to 15 mm. fragments were found in quantity. thumb depressions equally spaced about its sides. the appearance of having been subjected to great heat, and so melted. lug (PI. 3, C), 2. teat-like lug (PI. 3, D), and 3. no lug (PI.3, B, E). (facing p. 234) and Honey (1946, Pi. 50, D). 20 Francis, 1926, Pis. 4-5; Honey, 1946, Pi. 52. 21 Higgs, 1942, p. 38.
and rings of various sizes. diameter of 2.8 cm. to 3.5 cm. long with a head diameter of 3 cm. A variation of the broad headed nail is the rosette nail about 3 cm. 1.5 cm. long, one-third of the way down the pin from the flat end. One iron pin is curved and has a large head. and pieces with rivet holes. 4.2 cm., with a hollow pin 5.6 cm. long attached at its base. information on the cannon must await study of the various specimens. of a pistol ball with a lead projection on the side was also found. able for building blocks, roughly hewn, and measuring 5 to 7 cm. from the escarpment, on the clay floor a copper coin was found. three limestone rocks were found in the feature. appeared to have been the charred end of a wooden stake. were found animal bones and some fish vertebrae. rim which fits onto a goblet found 23 feet away, but at the same level. throughout the depth of the occupational stratum. and iron were found in all of the squares excavated. the region, settle here simultaneously? sion is that the Europeans and Indians lived there at the same time. rather than the alternative of 1662-1696.
of the Saint Augustine Period was predominately simple-stamped. Augustine seem to coincide very well. makes 1696 to 1725 the more likely. 24 Higgs, 1942, p. 38.
been suggested, and they should be summarized. be found, as, according to Dickinson, the site was occupied in 1696. 28 Higgs, 1942, p. 36. 29 Data summarized from Higgs (1942, mostly on page 28). has been prepared, but has not been published. the Higgs site was not a Spanish mission. clay pipes is inconsistent with the cultural picture of a Spanish site. from the English in view of the friction between the two groups. materials which suggest a European type of construction. son or stronghold was important. was using the cultural items found at the site. and which is also in the immediate vicinity of the Higgs site. dating from about the middle of the postulated time range. 32 Both sets of data are from personal communications. 34 From an unpublished bibliography on the area by Charles D. Higgs. pirates hangout of the following year. to the base of the midden. occurred in sporadic pockets throughout the deposit. midden remaining, perhaps no more than 6 or 8 feet high. Editor. 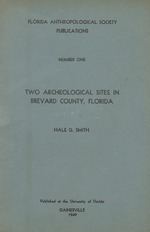 volume on Florida archaeology by Yale University. entire midden actually was built. part of the same structure. tempered form of unknown cultural affinity. Method of manufacture. Segmental coiling. holes of various sizes throughout core which may be fiber impressions. Texture. Paste has a laminated appearance. between lands 1 mm. in width. Form. Rim. Straight or slightly incurved. Body. Shallow bowl forms are indicated. paratively small checks with wide lands. Texture. Compact, crumbles when broken. Color. Exteriors are red, buff and gray, with some brown and black. black with surface color extending inward from 1 to 2 mm. have had a scalloped lip. Body. Shallow bowl with curved sides. Thickness. 4 to 6 mm. times, or, before contact materials reached the area. 3 Goggin, 1947. See also revisions in Goggin (1948). 5 Irving Rouse, personal communication. 1945. Gods Protecting Providence. (E. W. and C. M.
Andrews, eds.). Yale University Press, New Haven. Mexico Anthropologist. Vol. 3, pp. 35-40. Anthropologist, Vol. 4, pp. 22-33. Albuquerque. Glades Area, mimeographed. New Haven. and Periods in Florida, American Antiquity, Vol. The Florida Anthropologist, Vol. 1, pp. 57-60. n. p.
Washington Academy of Science. Vol. 35, pp. 218-223. 1942. Florida Dunes and Scrub, Vegetation and Geology. Florida Geological Survey, Bulletin 23. Tallahassee. 1. Two Archeological Sites in Brevard County, Florida. Hale G.
Smith. 31 pp., 2 figs., 4 pis. Price $0.50.